OAKLANDON CASE IS HEARD ON AN APPEAL Judge Alford and a Jury in the Criminal Court yesterday began the hearing or a case that has been a source of much contention in the little town of Oaklandon and that has heretofore been aired in Justice Stout's court. It was the trial of Harry West on the charge of assault and battery on Mrs. Celestia Watson. In the justice court West was found guilty and fined $5 and costs, and the case was being heard yesterday on an appeal. 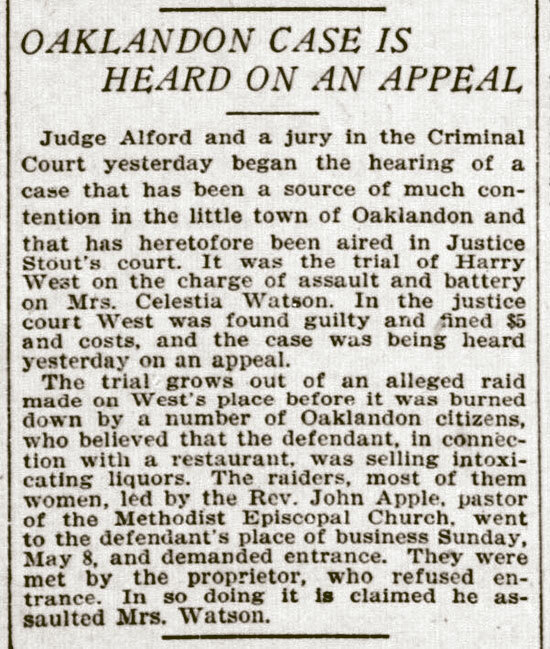 Tho trial crows out of an alleged raid made on West's place before it was burned down by a number of Oaklandon citizens, who believed that the defendant. In connection with a restaurant, was selling intoxicating liquors. The raiders, most of them women, led by the Rev. John Apple, pastor of the Methodist Episcopal Church, went to the defendant's place of business Sunday, May 8. and demanded entrance, they were met by the proprietor, who refused entrance. In so doing it Is claimed he assaulted Mrs. Watson.